South Korean baseball veteran Kim Sang-hyun has been ruled eligible to return to the top professional league a year after an off-field incident forced him out of competition. The KT Wiz in the Korea Baseball Organization said Friday they will reinstate Kim, 36, from their restricted list and then will waive him. The Wiz placed Kim on that list on July 13 last year, after Kim was charged with engaging in lewd conduct in public. Players on the restricted list are ineligible to perform anywhere in the KBO without permission from their original club. Kim was eligible to come off that list after one year. The Wiz decided to take him off the list but will instead make him seek opportunities elsewhere. The Wiz explained that they decided to part ways with Kim given the direction they're taking. Kim, as an aging veteran who's toiling in the independent league this year, may offer little help to a mostly young club mired in last place at 28-56. 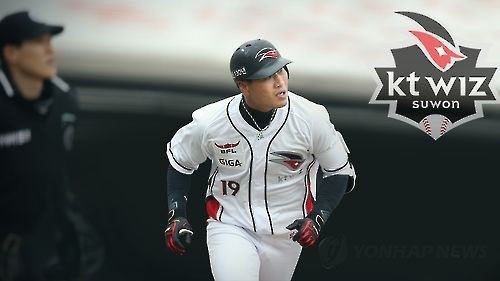 Kim was voted the league MVP in 2009 while playing for the Kia Tigers, with 36 home runs, 127 RBIs and a .315/.379/.632 line. He had a string of sub-par seasons but enjoyed a career renaissance with the Wiz in 2015, hitting 27 homers and driving in 88 runs in the club's inaugural season. In 2016, the infielder batted .225 with 11 homers and 32 RBIs in 62 games. The Wiz said they will honor the remainder of Kim's contract.